"Imam al-Hasan (a)" and "al-Hasan b. 'Ali (a)" redirect here. For the 11th Imam of the Shia, see Imam al-Hasan b. 'Ali al-'Askari (a). Al-Ḥasan b. ʿAlī b. Abī Ṭālib (a) (Arabic: الحسن بن علي بن أبي طالب) (b. 3/625 - d. 50/670), son of Imam Ali (a) and Lady Fatima (a), is the second Imam and caliph of the Shi'as and became caliph and Imam at the age of 37. He accepted a peace treaty with Mu'awiya in 41/661. His caliphate lasted six months and three days. He went to Medina after the peace treaty, and stayed there until he was martyred ten years later. He was buried in the Jannat al-Baqi' cemetery. He accepted the peace treaty with Mu'awiya because of his responsibility of Imamate and preserving the unity of Muslims. His decisions show his solemn and tolerant personality. His caliphate and peace treaty with Mu'awiya were among the most important events in his life and in early Islamic history. It demonstrated an example of unity at that time and as a moral and religious teaching, it greatly regulated Muslims and especially Shi'as throughout their history in their approach towards fundamental concepts like sovereignty, war and peace. Al-Hasan b. 'Ali b. Abi Talib (a) was the eldest son of Imam Ali (a) and Lady Fatima (a), the daughter of the Prophet (s). He was the second Imam of the Shi'as, was known as Imam al-Hasan (a) and was a Hashimi from the tribe of Quraysh. Imam al-Hasan (a) was born in Medina in the night or the day of Ramadan 15, 3/March 1, 625. However, in al-Kafi, al-Shaykh al-Kulayni reports that his birth was in 2/624. The Holy Prophet (s) recited adhan in his ear and slaughtered a sheep as aqiqa on seventh day after his birth. It has been narrated that at the time of his birth, God told Gabriel to go to the Prophet (s), greet and congratulate him and say, "Surely, to you, 'Ali is the position of Aaron to Moses; therefore, name the baby after Aaron's son." Gabriel did so and told the Prophet (s), "God has ordered that you name the baby after Aaron's son." The Prophet (s) asked, "What was the name of Aaron's son?" Gabriel answered, "Shubbar". The Prophet (s) told Gabriel, "But my language is Arabic." And Gabriel said, "Then name him al-Hasan." And so, the Prophet (s) named him al-Hasan. His Kunya is Abu Muhammad. Al-Mujataba, al-Zaki, al-Taqi, Karim Ahl al-Bayt (lit. : the munificent of Ahl al-Bayt) are some of his most famous epithets. The Prophet (s) used to call him al-Sayyid. Nafila or Ramla, who was a concubine. Umm 'Abd Allah, Fatima, Umm Salama and Ruqayya who were from different mothers. Al-'Allama al-Majlisi mentioned Abu Bakr among the children of Imam al-Hasan (a). Al-Shaykh al-Tabrisi mentioned nine sons and seven daughters for Imam al-Hasan (a). Ibn al-Jawzi, Ibn Hisham and al-Waqidi listed fifteen sons and eight daughters for Imam (a) and mentioned their names. According to reports, from among the daughters of Imam (a), Umm al-Husayn married to 'Abd Allah b. al-Zubayr, Umm 'Abd Allah married to Imam al-Sajjad (a) and Umm Salama married to 'Amr b. Mundhir b. al-Zubayr. Of the sons of Imam al-Hasan (a), four of them, al-Hasan al-Muthanna, Zayd, 'Umar, and al-Husayn al-Athram could have children. The lineages of al-Husayn al-Athram and 'Umar were lost soon and only the lineage of al-Hasan al-Muthanna and Zayd continued. The children of Imam al-Hasan (a) are called Sadat al-Hasani. They had many social and political movements during history. They made uprisings in the second/eighth and third/ninth centuries and established several governments in different places in Islamic countries, some of which are still in power. In some places, this line of Sadat is known as Ashraf. Tabataba'i, Mudarris, Hakim, Shajariyan, and Gulistana families are branches of Sadat al-Hasani. Imam al-Hasan (a) spent seven years of his life at the time of the Prophet (s). He (a) was also with the Prophet (s) in many events after hijra, such as the event of Mubahala. Imam al-Hasan (a) was one of the people addressed by the Prophet (s) in the hadith al-Kisa' and referred to in the al-Tathir verse in the Qur'an which are among the important proofs for his infallibility. Moreover, he (a) was with his brother al-Husayn (a) in Bay'a al-Ridwan. He (a) and his brother al-Husayn (a) were present upon the deathbed of the Prophet (s) when he (s) passed away. 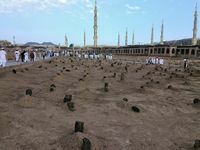 In Shia and Sunni sources, there are notable hadiths about the position of al-Hasan (a) in the eyes of the Prophet (s). Bura' b. 'Azib says, "I saw the Prophet (s) while al-Hasan was on his shoulders and the Prophet (s) was saying, "O God, I love him! May You love him too!" In another hadith, it is reported that while the Prophet (s) had placed al-Hasan (a) and al-Husayn (a) on his lap, he said, "These are sons of my daughter. O God! I love them; so May You love them too! And love those who love them!" Elsewhere, the Prophet (s) has said of Imam al-Hasan (a) and al-Husayn (a) that, "al-Hasan and al-Husayn are two leaders of the youths in paradise. "; "These two sons of mine are two fragrant flowers in this world"; "al-Hasan and al-Husayn (or these two children of mine) are Imams, whether they rise up or sit (make peace). "; "If intellect could be represented in human form, it would be al-Hasan." "The beginning of reason is nice behavior with people and through reason, one can achieve both this world and hereafter. One who does not have reason, has lost both this world and hereafter." One day, when Imam al-Hasan (a) was a child, he came to the mosque when Abu Bakr was giving a lecture on the pulpit. Imam al-Hasan (a) called Abu Bakr angrily and said, "Come down from my father's (a) pulpit!" Abu Bakr answered, "By God, you are right! This is your father's pulpit, not my father's!" Imam al-Hasan (a) and Imam al-Husayn (a) did not participate in the battles leading to the conquest of Iran by Muslims. However, some historical reports have mentioned Imam al-Hasan's (a) participation in some wars. When a council was formed to choose the caliph after 'Umar, which eventually led to the choosing of 'Uthman as the third caliph, 'Umar asked Imam al-Hasan (a) to attend as a witness in that council. This shows his social status as one of the Ahl al-Bayt (a) and also his position among the Ansar (Helpers) and Muhajirun (the Immigrants). When 'Uthman banished Abu Dhar to Rabadha, he ordered that no one should see him off and or speak to him. 'Uthman ordered Marwan b. Hakam to banish Abu Dhar from Medina. Thus, when leaving Medina, no one dared to see Abu Dhar off. However, Imam Ali (a), his brother, 'Aqil, Imam al-Hasan (a), Imam al-Husayn (a) and Ammar b. Yasir came to bid Abu Dhar farewell, and see him off. It is mentioned in historical sources that when people were rebelling against the third caliph, Imam 'Ali (a) tried to protect 'Uthman from being killed by angry rebels in order to preserve Islam. As such, he sent his sons to Uthman's house in order to ensure his safety. However, standing against the rebels was so difficult that 'Uthman was eventually killed. All of this being said, it is important to mention that there are many disagreements in the details of the event. Imam al-Hasan (a) and Imam al-Husayn (a) participated in the battles of Jamal, Siffin and Nahrawan. When Abu Musa al-Ash'ari, the governor of Kufa, did not cooperate with Imam Ali (a)'s delegation in order to stand against those who waged the Battle of Jamal, Imam 'Ali (a) sent 'Ammar b. Yasir and Imam al-Hasan (a) with a letter to Kufa. Imam al-Hasan (a) delivered a sermon in the Mosque of Kufa and managed to convince about 10,000 people to join and stand against the army of Nakithun. Also, before the Battle of Jamal, Imam al-Hasan (a) delivered a sermon and Imam 'Ali (a) sent him to lead the right wing of the army. Some say that Imam 'Ali (a) gave a spear to Muhammad al-Hanafiyya and told him, "Take this spear and kill the Jamal (Aisha's camel, which many people had died defending)". Muhammad went and failed in the task due to the volley of arrows. Then, Imam al-Hasan (a) took the spear and killed the camel. In the Battle of Siffin, when Imam 'Ali (a) saw Imam al-Hasan's (a) fight, he ordered him and Imam al-Husayn (a) to draw back so that they could stay safe. Imam 'Ali (a) also commanded his army to help in this regard, and said: "Stop my sons from fighting, because I am worried about their lives and I fear that the progeny of the Prophet (s) may discontinue." During the war, when Mu'awiya saw Imam al-Hasan's (a) fight, he wanted to bribe him to stop him from fighting. So, he sent 'Ubayd Allah b. 'Umar, the youngest son of the second caliph to bribe Imam al-Hasan (a) and offer to make him a caliph. 'Ubayd Allah approached Imam al-Hasan (a) and told him, "I want to tell you something." So, Imam al-Hasan (a) stopped fighting and went to him. 'Ubayd Allah told Imam al-Hasan (a) about Mu'awiya's offer, to which Imam al-Hasan (a) told him angrily, "I see you will be killed tomorrow or the day after. Satan has deceived you and beautified your actions [so that you would come and tell me this] so that the day will come when the women of Syria will mourn over your body. Soon, God will kill you and your body will be dragged on the ground on your face." 'Ubayd Allah came back to the tents. Upon seeing him, Mu'awiya figured out what al-Hasan's response was and said, "He (Imam al-Hasan (a)) is the son of that father ('Ali (a))"
To prevent sedition after the event of the arbitration (Hakamiyya), Imam 'Ali (a) asked Imam al-Hasan (a) to give a sermon in order to explain the reality of the situation for people and Imam al-Hasan (a) did so. Letter no. 31 of Nahj al-Balagha is the famous will of Imam 'Ali (a) to Imam al-Hasan (a), which was written on the way back from the Battle of Siffin. Imam al-Hasan (a) attained the position of Imamate on the eve of Friday, 21st of Ramadan 40/January 28, 661 when 'Ali (a) was martyred by Ibn Muljam al-Muradi. Thereafter, the Muslims of Kufa gave allegiance to him. He appointed governors and commanders and 'Abd Allah b. 'Abbas was appointed as the governor of Basra. The following hadith from the Prophet (s) is an assertion of the Imamate of al-Hasan (a) and al-Husayn (a), "These two sons of mine are Imams, [whether they are] rising or sitting [making peace]". Imam 'Ali (a) told Imam al-Hasan (a) his will and then asked Imam al-Husayn (a), Muhammad al-Hanafiyya, his other children, noblemen of the Shi'a, and his family to bear witness to his will. Then, he entrusted Imam al-Hasan (a) with his Quran and his sword and told him, "My son! The Noble Prophet (s) ordered me to appoint you as my vicegerent and to entrust you with my Quran and sword in the same way that the Prophet (s) appointed me as his vicegerent and entrusted me with his Quran and sword and ordered me to tell you that when you see the signs of death in you, you should entrust your brother al-Husayn (a) with these [trusts]." After the martyrdom of Imam Ali (a), people rushed to Imam al-Hasan (a) to give allegiance to him. He (a) went up on the pulpit and gave a sermon. After the sermon, 'Abd Allah b. al-Abbas called people to give allegiance to him. Imam al-Hasan (a) accepted the allegiance of people from Iraq provided that they fight with anyone he (a) fights with and make peace with anyone he (a) makes peace with. Some people who were ready to fight with Mu'awiya, thought that he (a) wanted to make peace with him. They went to Imam al-Husayn (a), but he (a) said that he (a) would obey his brother. Then, they returned and gave allegiance to Imam al-Hasan (a). This way, Muslims of different regions such as Iraq, Hijaz, and Iran acknowledged the caliphate of Imam al-Hasan (a). But, Syria, which was under the heavy dominance of Mu'awiya and his companions, did not give allegiance to Imam al-Hasan (a). According to some reports, Imam al-Hasan (a) did not take any measure toward war or peace for about 50 days or more after the martyrdom of his father and the allegiance of people. The first measure of Imam (a) after allegiance was doubling the salary of soldiers. "Think, because thinking is the life of the heart of a man who sees and is the key to doors of wisdom." When informed of Imam 'Ali's (a) martyrdom and that people had given allegiance to Imam al-Hasan (a), Mu'awiya sent two spies to Kufa and Basra in an attempt to incite the people against Imam al-Hasan (a). So, Imam al-Hasan (a) ordered the arrest and punishment of the two. Letters were exchanged between Imam al-Hasan (a) and Mu'awiya and in them, Imam al-Hasan (a) proved his right to the caliphate. Mu'awiya tried to mobilize his army and sent letters to his governors asking them to support him. He led his army towards Iraq and left Dahhak b. Qays al-Fihri in the capital as his temporary substitute. It is reported that 60,000 soldiers or more accompanied Mu'awiya. When the army of Mu'awiya crossed Manbaj bridge over Euphrates, Imam al-Hasan (a) asked people of Kufa to prepare themselves for jihad and ordered Hujr b. 'Adi to mobilize people. Imam (a) joined the army of Kufa in Sabat of Mada'in and in a sermon, called people to unity and said that reconciliation is better than disunity, rancor and enmity. People understood from his speech that Imam (a) wanted to make peace with Mu'awiya. Thus, some people accused him of disbelief and attacked his tent and many people left him. Also, Mu'awiya sent a letter to 'Ubayd Allah b. 'Abbas, the commander of the army of Iraq and pretended that Imam al-Hasan (a) asked him for peace and mentioned that if 'Ubayd Allah accepted to side with him immediately, he would give him government and great amount of money. So, 'Ubayd Allah who had thought that Imam (a) had asked for peace, sought his personal interests and accepted Mu'awiya's request and joined Mu'awiya at night with two third of his army. One of the consequences of this event was that some of the chiefs of Iraqi tribes wrote a letter to Mu'awiya and expressed their support for him. After this event, Mu'awiya wanted to bribe Qays b. Sa'd who had become the commander of Iraq's army but failed. He observes the Book of God, the conduct of the Prophet (s) and the conduct of the righteous caliphs. He appoints no one as the caliph after himself; and after him, the caliph should be elected by a council of Muslims. Lives, property and children of people should be safe everywhere. Mu'awiya should not implicitly or explicitly plot against al-Hasan b. 'Ali or threaten any of his companions. 'Abd Allah b. Harith and 'Amr b. Salama bear witness upon this peace treaty." With the conditions made by Imam al-Hasan (a), the peace treaty was signed in 41/661. However, even though Mu'awiya signed off on them, he denied all of the conditions in his first sermon in Kufa, where the two armies were supposed to meet. He claimed that Imam al-Hasan (a) was asking for peace and insulted Imam 'Ali (a). Imam al-Husayn (a) wanted to respond to his insults, but Imam al-Hasan (a) prohibited him from doing so. Then, Imam al-Hasan (a) delivered a sermon and explained everything with regards to the peace treaty and how Mu'awiya had asked for peace. He responded to the insults to his father in a very eloquent way and noted the honour and legacy that his family held as opposed to Mu'awiya's.This made Mu'awiya very angry. In different sources, different dates have been mentioned for the peace treaty, including Rabi' I of 41/July 661 and Jumada II/October of the same year. In al-Tanbih wa al-ishraf, al-Mas'udi considered Rabi' I correct and more famous. After the peace treaty, Imam al-Hasan (a) went to Medina and became the scientific, religious, social and political leader there. He took positions against Mu'awiya and his companions in Medina and Damascus and had debates with them. These have been mentioned and discussed in al-Tabrisi's al-Ihtijaj. After Imam al-Hasan (a) signed the treaty with Mu'awiya to protect the lives of Muslims and avoid any harms to their religion, the most difficult part of his life started. Criticism of people, observing political relations, and losing many of old companions and their martyrdom were among the hardships of this period for Imam (a). Even with the apparent solitude of Imam al-Hasan (a), this period of his life was one of his most influential yet difficult periods of his life; because, on the one hand, he (a) was the Imam of Shia and on the other hand, changes in his relations with Mu'awiya made it difficult for him to sort out the affairs of Shia. After the peace treaty, Imam (a) gave a sermon and pointed to this issue that Mu'awiya challenged him over his rights and explained the reasons for his peace which was to protect the lives of people and avoid bloodshed. After the treaty, Mu'awiya too gave a sermon at his first presence in Kufa. He broke his promises, saying that Imam (a) had asked for peace and cursed Imam Ali (a). Then, Imam al-Hasan (a) explained about the peace treaty in a sermon and the proposal of Mu'awiya for it and answered to Mu'awiya's disrespect to his father. Knowing the position of Imam (a), Mu'awiya respected it in appearance; for example, when Ziyad b. Abih was the governor of Kufa, a companion of Imam (a) was annoyed and Imam (a) wrote to him and prohibited him of any misbehavior. When Ziyad gave a disrespectful answer to Imam (a), Imam (a) sent him a historical answer and also forwarded the issue to Mu'awiya and Mu'awiya accepted the request of Imam (a) and also seriously admonished Ziyad. Mu'awiya's planning for Yazid to take the power was among Imam's (a) most important criticisms to Mu'awiya; asking why a thoughtless drunkard should sit on the throne. Of course, there are so many examples of Imam's (a) enjoining to the good and prohibiting the evil against Mu'awiya, that in some cases, he (a) called the caliph to follow the Book [the Qur'an] and tradition of the Prophet (s). Considering Mu'awiya's disregard toward criticisms of Imam (a) and refusal of his requests, Imam (a) believed that until after Mu'awiya, no retaliatory action was prudent and emphasized on this. When leaving Kufa for Medina, Imam (a) asked his companions to keep themselves ready for an appropriate time. When some people of Hawazin tribe wanted to make an uprising under the banner of Saturad b. 'Alfa, Mu'awiya was preparing for the battle and asked Imam (a) to approve his action and considered his presence with himself necessary. But, Imam (a) made a smart move, mentioned a word of Imam Ali (a) on distinguishing those who made mistake from disbelievers and emphasized on it and refused Mu'awiya's request. Thus, he (a) refused to go under the flag of Mu'awiya leaving their relationships unharmed. It is mentioned in reports that regardless of his apparently justified behavior in public, Mu'awiya had secretly ordered to put Shia under surveillance and curse at Imam Ali (a) on the pulpits. He also appointed a person such as Ziyad as the governor of Kufa to follow this strategy. When the companions of Imam (a), some of whom were the companions of the Prophet (s), saw the actions of Mu'awiya and Ziyad b. Abih, criticized them and were always harassed by the government. What happened to 'Amr b. Hamiq al-Khuza'i in the last decades of his life was a clear example of such harassments. Because of his criticisms of Mu'awiya, 'Amr was chased up, captured, and martyred in the prison of Kufa. When Imam al-Hasan (a) was informed about the martyrdom of 'Amr, wrote a letter to Mu'awiya and severely reprimanded him. Another example of breaking promises by Mu'awiya is his behavior toward Hujr b. 'Adi and his companions who made serious criticisms about him. He ordered to capture them in Kufa and send to Damascus and finally martyred them. Rashid al-Hajari, a pious companion of Imam Ali (a) can be added to this list, who was martyred. In general, the last part of Imam al-Hasan's (a) life which included some journeys to Hijaz and Damascus, was a difficult period and Imam (a) passed through it using his wisdom and forbearance; and in practice, he (a) prepared the situation for the Imamate of his brother al-Husayn (a). According to the famous report, Imam al-Hasan's (a) martyrdom happened in 50/670. Most reports about the day Imam (a) was martyred refer to the last days of Safar including 28th . The 7th of Safar and even one of the days of Rabi' I have also been mentioned as the day Imam (a) was martyred. According to al-Shaykh al-Mufid, Imam (a) was 48 years old upon martyrdom. However, according to different reports about the date of Imam's (a) martyrdom, there are different opinions about the age of Imam (a). According to most of the Shi'a and Sunni sources, Imam al-Hasan (a) was martyred by poisoned food. However, some non-Shi'a sources hold that he died a natural death because of illness. According to a report, Mu'awiya sent someone to Ju'da, daughter of Ash'ath b. Qays (Imam al-Hasan's (a) wife) telling her that, "I will give you 100 thousand dirhams and will make you the wife of my son, Yazid, only if you give poison to al-Hasan (a)." Ju'da poisoned Imam (a) and Mu'awiya gave her the money, but did not make her the wife of Yazid. Ibn Sa'd has attributed the martyrdom of Imam (a) to one of Imam's (a) servants. Another report says that poisoning Imam (a) was done by the daughter of Suhayl b. 'Amr, the other wife of Imam (a) encouraged by Mu'awiya; but, according to the situation at the time of Mu'awiya who considered Imam (a) an obstacle against the princehood of Yazid, reports about poisoning Imam (a) by Ju'da bt. Ash'ath seem to be more reliable. According to reports, before his martyrdom, Imam (a) was poisoned several times, but survived. Al-Ya'qubi wrote, "Upon his demise, Imam al-Hasan (a) told his brother, al-Husayn (a), 'O brother! This is the third time I have been poisoned, but none of them was like this time and today I will die. So, when I die, bury me beside the Prophet (s) because no one deserves more than me to be close to the Prophet (s) unless this is prevented and in such a case, you should not allow any blood to be spilled." For his ziyarah text ziyarah text of Imam al-Hasan al-Mujtaba (a). When the corpse of the Imam (a) was taken to the mausoleum of the Prophet (s), Marwan b. Hakam and one thousand of his soldiers went to the ceremony with armaments and prevented the corpse from being taken into the mausoleum. According to Abu l-Faraj al-Isfahani, Aisha was a complicit in Marwan's plan, but according to another account, when Aisha saw what was happening, she prevented Imam al-Hasan's (a) corpse to be buried near the Prophet's (a) grave in order to stop possible unrests. At last, Imam al-Husayn (a) buried his brother's corpse in al-Baqi' cemetery. It is reported that at the request of Imam al-Husayn (a), Sa'id b. 'As, the ruler of Medina, said Funeral Prayer for Imam al-Hasan's (a) corpse, but given some hadiths according to which an infallible Imam's corpse can only be washed, and his Funeral Prayer can only be performed, by another infallible Imam, it seems that Imam al-Husayn (a) himself had already said the Funeral Prayer for his brother, but out of taqiyya (dissimulation), he offered the performance of the Funeral Prayer to Sa'id b. 'As in al-Baqi' cemetery, and he accepted the offer. Imam al-Hasan (a) resembled the Prophet (s) in personality, manner and nobility. It is narrated from the Prophet (s) that he told Imam al-Hasan (a), "O al-Hasan, you are like me in body (appearance) and morals (disposition and manners)." Imam al-Hasan (a) is one of the Ashab al-Kisa'. Also, in the event of Mubahala, the Prophet (s) took al-Hasan (a), al-Husayn (a), 'Ali (a), and Fatima (a) according to God's order. The Tathir verse is a great proof for the dignity and status of Imam al-Hasan (a) and the Ahl al-Bayt. Imam al-Hasan (a) went to Hajj 25 times and gave away a half of everything he had for the sake of God three times, such that once he gave away his shoes, keeping only slippers for himself. ↑ Al-Shaykh al-Mufid. Al-Irshad, vol.2 p.15; years 48, 49, 51, 57, 58 and 59 are also reported as the year of his martyrdom. Amin, al-Sayyid Muhsin al-. A'yan al-Shi'a. Beirut: Dar al-Ta'aruf li-l-Matbu'at, 1998. 'Amili, Sayyid Ja'far. Tahlili az zindigi-yi Imam al-Hasn al-Mujtaba. tra. Sipihri. Qom: Daftar Tabliqat, 1376Sh. Baladhuri, Ahmad ibn Yahya al-. Ansab al-ashraf. Ed. Muhammad Baqir Mahmudi. beirut: 1394AH. Bayhaqi, Ahmad b. al-Husayn al-. Al-Sunan al-kubra. Bukhari, Muhammad b. Isma'il. Sahih al-Bukhari. Dar al-Fikr. Harani. Ibn Shu'ba al-. Tuhaf al-'uqul 'an al al-rasul (s). Ed. 'Ali Akbar Ghaffari. Qom: Mu'ssisat al-nashr al-Islami. Juwayni, Ibrahim b. Muhammad al-. Fara'id al-simatayn. Beirut: Mu'assisa al-Mahmudi, 1980. Kulayni, Muhmmad b. Ya'qub al-. Al-Kafi. Dar al-Hadith. Majlisi, Muhammad Baqir al-. Bihar al-anwar li durar akhbar al-a'imma al-athar. Beirut: Mu'assisa al-wafa'. 'Aqiqi Bakhshayishi, 'Abd al-rahim. Chahardah nor-i pak. Tehran, 1381Sh. Ibn 'Abd al-Barr, Yusuf. Al-Isti'ab. Ed. 'Ali Muhammad Bijawi. Beirut, 1412AH. Ibn Sufi, 'Ali. Al-Majdi. Ed. Ahmad Mahdawi Damghani. Qom: 1989. Ibn Qutayba , Abd Allah ibn Muslim Dinawari. Al-Imamat wa al-siasa. Cairo: Mu'ssisat al-Halabi. Irbili, 'Ali b. 'Isa al-. Kashf al-ghumma fi ma'rifat al-a'ima. Majma' jahani ahl al-Bayt, 1426AH. Jawhari, Ahmad b. Abd al-'Aziz. Al-Saqifa wa fadak. Ed. Muhammad Hadi Amini. Tehran, 1981. Ja'fariyan, Rasul. Hayat Fikri wa Siasi Imaman-i Shi'a. Qom: Ansariyan, 1381Sh. Khalifa b. Khayyat. Tarikh. Ed. Akram dia' 'Umari. Beirut: 1397AH. Muqaddasi, Mutahhar b. Tahir. Al-Bad'u wa al-tarikh. Cairo: Maktabat al-Thaqafa. Mas'udi, 'Ali b. al-Husayn al-. Muruj al-dhahab. Qummi, 'Ali b. Ibrahim al-. Tafsir al-qummi. Najaf: Maktabat al-Huda. Qurashi, Baqir Sharif al-. Mawsu'at sirat ahl al-bayt. Qom: Dar al-Ma'ruf, 2009. Qurashi, Baqir Sharif. Hayat al-Imam Hasan b. 'Ali. Beirut: 1993. Shahidi, Sayyid Ja'far. Tarikh-i tahlili-i Islam. Tehran: Markaz-i nashr-i danishgahi, 1390Sh. Shaykh al-Mufid, Muhammad b. Muhammad -al. Al-Irshad. Qom: Sa'id b. Jabir, 1428AH. Shaykh al-Mufid, Muhammad b. Muhammad -al. Al-Jamal. Maktabat al-A'lam al-Islami. Shaykh al-Saduq, Muhammad b. 'Ali b. Babawayh al-. 'Uyun akhbar al-Rida. tra. 'Ali Akbar Ghaffari. Akhtar shumal, 1373. Shaykh al-Saduq, Muhammad b. 'Ali b. Babawayh al-.Amali. Intisharat Kitabkhani Islami, 1362Sh. Shaykh al-Saduq, Muhammad b. 'Ali b. Babawayh al-.Al-Khisal. Shaykh al-Saduq, Muhammad b. 'Ali b. Babawayh al-. 'Ilal al-shara'i'. Suyuti, Jalal al-din, Abd al-Rahman b. Abi Bakr al-. Tarikh al-khulafa. Tabari, Muhammad b. Jarir al-. Tarikh al-Rusul wa al-Muluk. Beirut: Mu'assisa a'alami lilmatbu'at. Tabarsi, Ahmad b. 'Ali. Al-Ihtijaj. Intisharat Uswa, 1413AH. Tabrisi, Fadl b. Hasan. A'lam al-wura. Mu'ssisa al al-bayt. Ya'qubi, Ahmad ibn Ishaq. Tarikh-i ya'qubi. Trans. Muhammad ibrahim Ayati. Tehran: 'Ilmi wa farhangi, 1378Sh/1999. Zamakhshari, Jar allah al-. Al-Kashshaf. Qom: Nashr al-Balagha, 1415Ah. Al-Sharif al-Qarashi, Baqir, The life of Imam al-Hasan al-Mujtaba (a), translated by Jasim al-Rasheed, Qom,Ansariyan Publications. Shaykh Radi Al-Yasin, Sulh al-Hasan (The Peace Treaty of al-Imam al-Hasan (a)), translated by Jasim al-Rasheed, Qom, Ansariyan Publications. Imam al-Hasan bin Ali], Tehran, Al-Balagh Foundation. Al-'Abidi, Ghurrat al-'Ayn, Imam al-Hasan and caliphate, Qom, Ansariyan Publications. This page was last edited on 10 April 2019, at 06:22. This page has been accessed 132,103 times.